We start with good desires and goals, but often old sinful habits and desires rise up and we bite the dust. We know that eating the dirt is the lot of the Serpent not a child of the Living God. We know what we should do but often - at the point of temptation - we yield to sin rather than to God. 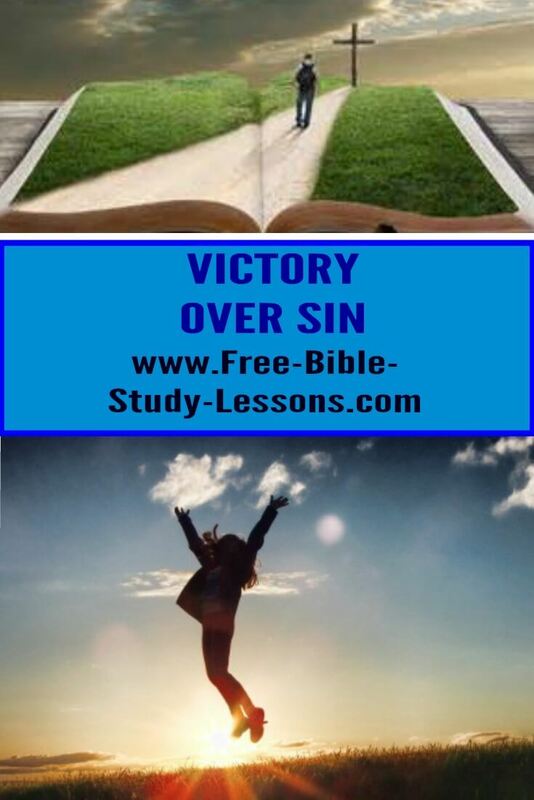 What can be done to have victory over sin in our lives? What is sin anyway? Is it just doing bad things? If we want to discover the truth about sin we need to go back to the source. Sin entered the world through the disobedience of Adam. This was more than simply eating a forbidden fruit. It was a defiant act of rebellion against the loving Lord Who created him. It was high treason by the lord of earth against the Owner of the earth. Ever since that time mankind has been in defiant rebellion against God. Every sin - no matter how "small" - is a hateful declaration of independence from God. It is a cursing and spitting in the face of Jesus Christ. Every human being is born with a sin nature. We hate God from the day we are conceived. We have no thought of turning to God unless it is to try to sinfully use Him as some kind of divine Santa Claus. We would never seek God. We see Him as our bitter enemy. How we express this may be overt or covert, but it is there. You may be reading this and saying to yourself, "I've never felt that way about God." You are self-deceived. Every time we deliberately sin we are making a conscious statement of our defiant rebellion against God. We also need to know the difference between Sin and sinning. Before God saves us Sin is our nature. It is who we are. We commit sins because we are Sinners. The main problem is not that we commit sin, but that Sin has totally corrupted us. 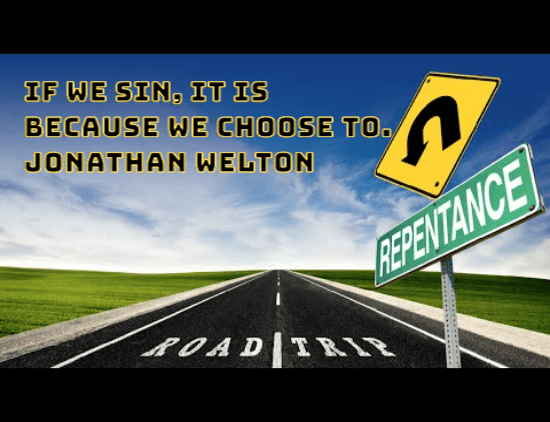 After God has saved us, Sin is no more our nature. We have been given a new nature. Now when we commit a sin we are violating our nature. It is no longer who we are. When we are Sinners, sin is like a cancer throughout our entire bodying eating us up from the inside. After we are saved, sin is like a disease attacking our body from without. It still has to be dealt with in order to have a healthy body, but it is an external enemy. When we were sinners, sin was our natural state. We overtly or covertly hated God and we wanted it that way. Then God, in love and mercy, reached into our hardened hearts, softened them, and gave us a new nature - a nature that wants to please God. [This is why only those chosen by God can be saved. If God does not work in our hearts we will always seek our own ways. Our human nature is so corrupt that no one can even believe on God unless God first gives Him the faith to do so.] Now we want to please God. We do not want to sin, but temptation comes and at times we fail. How do we live in the victory over sin that our heart desires and yearns for? The first thing to realize is that all things begin and end with God. It is the Blood of Jesus that takes care of the Sin nature. We are so infected with the cancer of Sin that death is the only way out. No healing is possible for the Sin nature. That is why Paul tells us we died with Christ that we might be risen to new life in Him [Rom. 6]. When we come to Jesus as Lord and Saviour our Sin nature is killed. We are then resurrected to life with a new nature. There is no other way to get rid of the corruption of Sin. Physically dying outside of Christ simply seals us to the Sin nature forever. As genuine Christians, Sin is no more who we are. However, when we were saved we carried over many of the evil thought patterns and actions of the old nature. We no longer commit sins because we are sinners, but our old desires and Satan's forces come to us to trick us into committing sins to violate our new nature and hurt our new Master. For the non-Christian no victory over sin is possible. Yes, through will power they many conquer individual sins, but the nature is still there. It is like polishing the brass on a sinking ship. The Christian, with a new nature, now begins a lifetime war of defeating individual sins and bringing his physical life up to God's standard which he has attained spiritually in Christ. This report is not about victory over the Sin nature. That is salvation and is dealt with in An Introduction To Life. The remainder of this reports assumes the reader is already a Christian with a new nature [there is no other kind!]. Perhaps a better title would be: How Do I Apply Christ's Victory Over Sin In My Life? If not for the blood of Jesus no victory over sin would be possible. The blood of Jesus not only saves us from the sin nature, but also it provides the authority that is needed to have victory over sin specifically. We have to know that the Blood of Jesus is more powerful than ANY sin. Sometimes we are tempted to think that one of our sins is too big to handle. That is devaluing the Blood of Christ. Do not lose hope. There is no sin which is too big for God. [If you are worried about the Unpardonable Sin, don't. We may deal with it in another report, but for now: if you have a sincere desire to have victory over sin, you haven't committed it.] Victory over sin takes place on two levels. First, we must know what our position is in Christ. Second, we have to know how to practically apply this knowledge in our everyday lives. First, as mentioned above, we have a new nature. The Blood of Christ has washed us clean from every sin. We stand pure and holy in the sight of God. We are "in Christ" which means, among other things, that when God sees us and relates to us He does so because He sees the righteousness of Christ. This not some spiritual trick. It the legal way God applies the righteousness of Christ to us and how Christ was able to take our sins to the cross with Him. We must see our position in Christ. We are perfect in Him. We also have to know that the Blood of Christ, applied by the Holy Spirit - Who is actively working in our lives, is more powerful than any sin. In fact, we have to face the reality that now we do not have to sin. Sin is defeated in Christ. In Christ we already have victory over sin. Anytime a Christian sins it is because he or she chooses to. The sin may have become such a habit that it seems automatic and uncontrollable, but that is not the truth. We must face this. We have to take responsibility for all of our actions. When we sin we must come to God, take responsibility for our action, confess our sin, ask forgiveness, and seek God's solution to overcoming that particular sin. One of the practical ways to apply this first level in our lives is to look up all the verses which declare who we are in Christ. Meditate on them realizing that this is NOT something we have to attain, but who we already ARE. Memorize key verses. Pray. Also, in knowing who we are in Christ, we need to realize that no temptation that we face is unique. The devil tries to get us into self-pity by telling us that no one has ever suffered like we do or we are the first to face some sin/problem. Every age of humanity puts new faces on old sins. If you strip away all the superficial details, every sin or problem we face has been faced and defeated by thousands of sincere believes who have gone before us. We are not the first. We are not God's special guinea pig for a new experiment! Others have gained the victory over the sin we are struggling with...and we will too. We cannot stop at the first step in victory over sin. We must begin by realizing who we are in Christ, knowing His blood has conquered all sin, and that the Holy Spirit is actively working in our lives. Then, from that firm foundation, we can tackle the sin that so easily entangles us. Second, what are some practical ways to achieve victory over sin? The best way to have victory over sin is to avoid the temptation to start with. When you consider the weak area in which you need victory over sin, think of the times or conditions in which you are the weakest. Is it when you are with a certain person? Is it after a certain event has happened? Is it associated with a particular place? And so on. Next, consider if it is is possible to avoid the temptation. For example, a person who is tempted to purchase lustful magazines in a store he passes on the way to work should consider if there is a different route he could take which does not pass such stores. Temptation may still come, but by avoiding it as much as possible we take ourselves out of harms way. Many times we don't avoid the temptation when it is possible because we secretly enjoy our sin. We set ourselves up for failure and then we excuse ourselves by saying we could not help it. Nonsense. Be honest. Take responsibility. Plan to avoid temptation as much as possible. Note: In avoiding temptation we must avoid trying to help people - even friends - who have the same weakness. If you have taken the Blood Covenant course you know that God puts strength to weakness. If someone who also has your weakness wants help be prepared to direct them to someone who is strong in that area. [We ALL have areas of strength and weakness.] Do not try to help them yourself - no matter what they say - or you will enter into temptation again. If necessary break off the friendship. In the same way, do not go to someone with the same weakness for help. Seek out someone who is strong in that area. The second best way to deal with temptation and have victory over sin is to flee. Run. Don't hesitate. Get out of there. Sometimes temptation takes us by surprise. It seems to come out of nowhere to lay it's slimy hands on us. It becomes impossible to avoid. The next option is...RUN. Interestingly, the Bible's only instruction on sexual temptation is to flee, never to fight or argue. This can apply to other types of temptations as well - especially deeply ingrained habits. God is faithful. He will always provide a way out...if we are willing to take it. Sometimes we are too proud to take it. Sometimes we are afraid of appearing rude or losing friends. Don't let these or other considerations stop you. Victory over sin is your priority. The devil would have us think that running from temptation is the coward's way out. Liar. Often it is God's way out and if we are too proud to take it, we will fall. There are times; however, when we can neither avoid temptation nor run away from it. Jesus faced this in the wilderness. He was tempted directly by the devil with no possibility of avoidance or retreat. Notice carefully, Jesus responded to each temptation with faith in the Word of God. He did not argue, He did not try to "present His case," and He did not have an overconfident attitude. He kept His answers short and quoted only the Word of God. He also recognized when the Word of God was being used out of context. If we are submitted to God, the devil will flee from us and we will have victory over sin. We are in Christ and He knows Christ has already defeated him. His trick is to get us to fight him on his own ground. If we are deceived into that, we will lose every time. What happens when we have an ingrained sinful habit? Maybe we have had the habit of losing our temper or swearing or bitterness, or whatever. We have done it so often that it seems automatic and uncontrollable. The Biblical principle is found in putting off and putting on. It is not enough to stop doing a sinful habit in order to have victory over sin. That is only half the issue. The other half is replacing the sinful habit with a Godly habit. If we are going to have permanent victory over sin we have to replace the sinful habit with a Biblical habit. We have to search the Scriptures diligently to see what is the Biblical action. For example, a person who struggles with greed must begin tithing [as we all should] and giving generous offerings. The Bible has the practical answer for every problem. In addition to the above, in our fight to have victory over sin, we must be accountable to someone. It needs to be someone a] who we can trust, b] we can share freely with, and c] who is strong in that particular area. It can be more than one person. In a healthy marriage, the spouse would be the most important person to be accountable to. There may be others as well: pastors, close friends, mature Christians. This accountability is not only to have someone who we can share freely with and get help from, but also they should be able and willing to "check up" on us and see how we are doing on their own initiative...and be honest and courageous enough to confront us if we need it. When a Christian fails they do not come under condemnation. Instead, they come under conviction. When we fail we come to God, confess our sin, repent, confess to anyone our sin has affected, ask forgiveness from God and others who have been hurt, make Biblical restitution as much as possible, and then go to work again at having the victory over sin. You are never truly defeated until you give up.